Keep your beard in tip-top condition with the Recipe for men Beard Elixir. Formulated with an expert blend of natural oils and extracts, the multi-tasking elixir will soften, condition and enhance shine, whilst helping to relieve redness, itching and irritation. A great addition to your personal grooming routine, the beard oil contains pine oil, lemongrass and extracts of sea buckthorn to prevent dandruff and provide an anti-fungal action. Your beard will be left looking healthy and easy to comb. - L.M. 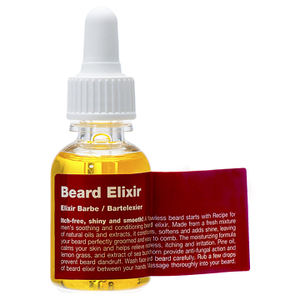 Directions for Use: Rub a few drops of beard elixir between your hands and massage thoroughly through your beard.